I spoke in Parliament yesterday about problem gambling and its impacts on the Lake Macquarie community. Clearly, the clubs and pubs do an enormous amount of good, but there is a significant downside to their poker machines and the damage they cause to many vulnerable people and those around them. I supported the Government's new laws, but they don't go anywhere near far enough. Poker machines are not the only area in need of attention. Something has to be done about the advertisements for sports betting agencies, as well as online casinos. It's a tricky area, but we simply cannot ignore the damage the gambling industry is doing. Mr GREG PIPER ( Lake Macquari e ) ( 17:07 ): I speak in debate to the cognate bills: the Liquor and Gaming Legislation Amendment Bill 2018, the Casino Control Amendment Bill 2018, the Gaming Machines Amendment (Leasing and Assessment) Bill 2018 and the Registered Clubs Amendment (Accountability and Amalgamations) Bill 2018. For those in the gallery, those bills are in the Chamber. They are available online and make fascinating reading. The gaming industry reforms in the cognate bills are a step in the right direction but they are only a small step towards addressing the chronic issue of problem gambling in this State. I acknowledge the Minister with carriage of the bills is present in the Chamber. I also acknowledge that it is not an easy sector to legislate. It is difficult for this Government to set policy because for many years the gaming industry has inextricably linked its fortunes to the gambling sector. I agree with the member for Sydney and I hope that in time we will have a government that will bring about changes to wind back the excesses of the gaming industry. Hopefully it will be done with the help of the industry but more than likely the industry will be kicking and screaming. It is hard to see how these reforms will effectively address issues such as suicide, family breakdown and associated domestic violence, personal financial disasters and the levels of social harm that are seated in the community as a result of our addiction to gambling. I turn now to the Liquor and Gaming Legislation Amendment Bill 2018. I acknowledge the Minister and the Government are proposing genuine reforms in the bill such as identifying problem areas and capping the number of poker machine licences in those areas. That is not the level of reform that is needed. I acknowledge the Minister's assurance that the number of poker machine licences in the State will only decrease as a result of the forfeiture requirements in the new legislation. I trust that is true. However, those reforms do not stem the scourge of problem gambling and are not significant enough to make a difference. Capping poker machine numbers in a band 3 statistical area [SA] 2 such as Fairfield, but increasing the number in a band 1 SA2 area is a bit like shifting the problem from one area to another. No doubt a problem gambler will find a way to gamble somewhere, whether it is in Fairfield, the bigger poker palace 10 kilometres away, the casino at Pyrmont, or one of the countless pubs and clubs in our electorates around the State. I acknowledge that the bill provides an incentive for pubs to go pokies free. I imagine many premises would take up that opportunity if it is available. Currently every pub and club in my electorate houses poker machines. Some licensees admit there is a problem, which creates unwanted operational problems in small pubs and clubs. I understand that clubs and pubs in the community employ hundreds, if not thousands of people. They provide entertainment, support sporting and cultural groups, and are hubs for get-togethers with family, friends and neighbours. I know some pubs and clubs would operate without poker machines if they could. Poker machines are still a significant player in the gaming industry, which has a significant downside that must be addressed. Other speakers in this debate have mentioned the figures on the gaming industry—they are undisputed facts that must be reiterated. Incredibly, Australia has 0.3 per cent of the world's population but 20 per cent of the world's poker and gaming machines. More than 200,000 poker machines are located in Australia, and more than half of those are located in New South Wales. That is not the fault of this Minister or any particular government. It is now a struggle to unwind the gaming model that has developed. Three in every four problem gamblers have that problem because of poker machines in our clubs and pubs. In fact, 94,000 poker machines are located in what we call neighbourhood pubs and clubs. Problem gambling plays a role in as many as 20 per cent of all suicides. The gradual destruction of a problem gambler's life affects seven other people, mostly through financial hardship and disintegration of the family unit. 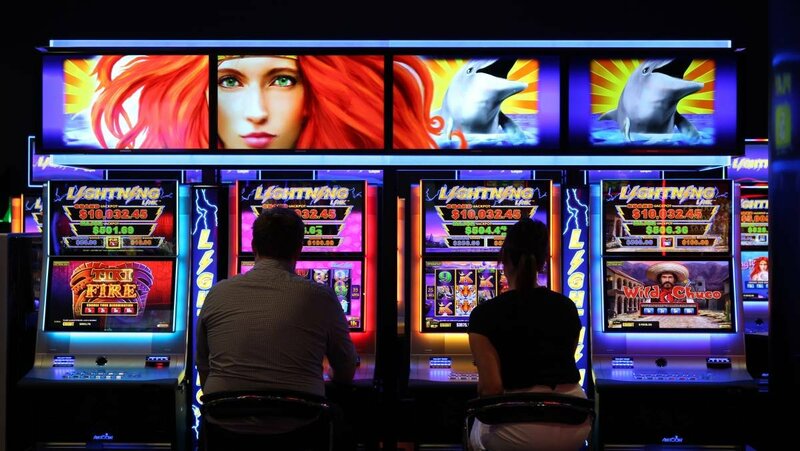 More than 2,000 poker machines are located in Lake Macquarie, which equates to approximately one per 100 people. The counsellor also told me about a 19?year?old man in my community who took his own life not long after seeking counselling. This teen had been a victim of a severe assault years earlier and had received a victim compensation payout. He lost the lot in less than a year playing poker machines. He felt that he had let down everyone around him and he was ashamed of what he had done—so ashamed that he took his own life. The counsellor told me that the number of people seeking help had skyrocketed after pubs were granted poker machine licences. That is obvious that that would occur. Pubs are not held to the same account as clubs, the counsellor said. They do not contribute to the community benefit funds and schemes to which clubs are required to contribute. Poker machines in clubs are easily accessed. That goes to my earlier point about the ineffectiveness of capping poker machine numbers in some areas and not in others because a problem gambler will move to the next pub or the one after that in the next SR2 area. It is a pointless exercise that will achieve very little. I do not wish to generalise about pubs in that way, because there are a number of pubs that do great things in their community and help a lot of people in many ways. But I give examples of poker machine use. Peak groups have long recommended a drastic review of the State's poker machine industry. These are the groups left to clean up the fallout from the gambling industry's failures. Recommendations have included a cap on the amount that can be bet at any one time on poker machines, a vast reduction in poker machine numbers, particularly in pubs, and most importantly, according to gambling counsellors in my electorate, the removal of note acceptors on machines and the removal of features in poker machine games. None of those recommendations is contained in these bills. A social gambler might walk into a club or pub and put $20 or maybe $50 through the pokies for a bit of fun and entertainment. That is not the problem. The problem is the impact that these machines have on people who are more vulnerable to their addictive nature. That is where we are failing, and that is where this legislation is falling short of the mark. As other members have noted, including Government members, these bills do little or nothing to stop the proliferation of advertisements for online betting or to stop international gambling houses operating online gambling in this State. One cannot turn on the television or watch a sporting match without being bombarded with advertisements for betting agencies. These ads need to go the same way as cigarette and alcohol advertising. Once again, these bills do not address this issue. On a similar note, any effort made in this place to reduce problem gambling will be pointless unless we can stop the rapid growth of online gambling sites based abroad. I do not know how to do that, but as one local gambling counsellor told me, "The politicians can take every poker machine in town and toss them into the lake, but it would do nothing for problem gambling if they still allow online casinos to operate from their bases in Macau, Monaco, London or other places overseas." Clearly, the problem is not just the poker machines, it is the culture that we have developed. Problem gamblers will look for other ways to continue gambling. I understand the problem faced by Government ministers in this regard. Hotels and registered clubs are an important part of our community, and many of these establishments go above and beyond in supporting their local community. It is a shame that the industry has been allowed to expand with a model so heavily dependent on gambling, particularly with poker machines. I will be supporting these bills, but if we are going to make a real and significant difference to the levels of problem gambling in this State we need to revisit this legislation again and again until we get to a point where people can have a reasonable flutter and where the industry itself is both answerable and sustainable. I believe this bill is trying to address this issue. The member for Tweed remarked that the gaming industry seems happy with this bill. I think that is a problem. We will know that we are getting close to the mark when the industry is loudly screaming and running campaigns against the Government on this issue. I have barely heard a whimper about this bill from members of the gaming industry, so I suspect that it will not affect them very much. I recognise the difficulty in balancing the need to do more on this issue with the need to protect the viability and sustainability of clubs and communities. But until we get to a point where significant change can happen, please gamble responsibly.